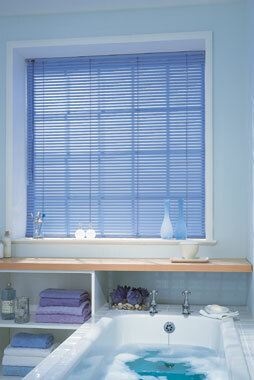 Aluminium venetian blinds can give you the option of tilting and turning the slats to give you optimum privacy and light control. 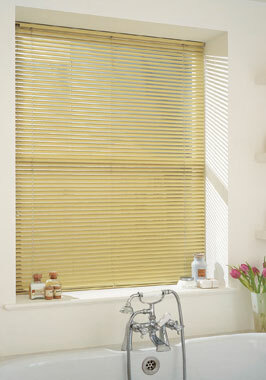 Our venetian blinds come in 4 slat widths 16mm, 25mm,35mm and 50mm widths in over 100 colours in matt and gloss finishes including metallics, Mirror chrome, printed finishes and aluminium wood effect to match a large range of wood flooring and laminated floors. 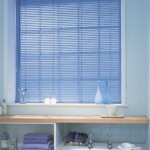 Venetian blinds are operated via a wand to tilt and turn and via cords to raise and lower the blinds, we also promote child safety at Blindfolded and fit breakaway cord acorns to the looped venetian blind cords so that if pressure is applied to the looped cords the connector is designed to pull apart thus helping to avoid serious injury or worse. 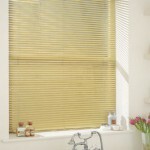 Our made to measure venetian blinds come with heavy duty brackets that are universally fitted ie: they can be face fixed to your frame or top fixed to the window lintel.